You’ll find nature-inspired colours, artworks and aromas in most UK spas. But why settle for imitation when you can experience the real thing during your spa day? You could be wandering through rose gardens or between borders of colourful flora; breathe in the sweet scents of herbs from kitchen gardens, and take a walk across lush green lawns through archways and arboretums. 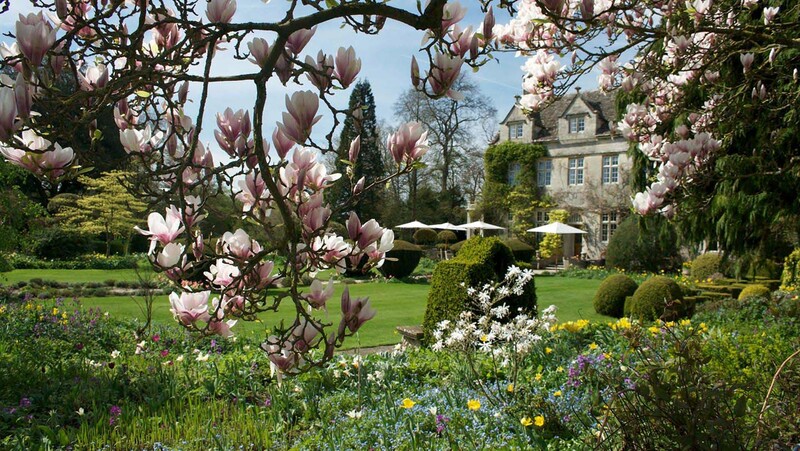 The gardens at Barnsley House were designed in the 1950s by celebrated horticulturalist Rosemary Verey. Over the years, the gardens have gathered a bit of a cult following, and the Prince of Wales is said to be a fan. Today, guests at Barnsley House can wander around at their leisure, while there are ‘tours with tea’ available to the paying public. 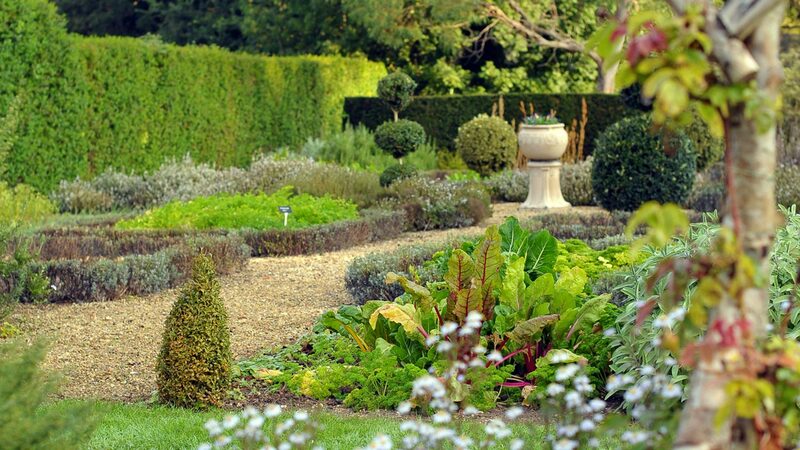 The gardens are visually delightful and full of produce that makes its way to the dishes at Barnsley House’s restaurant. Year round, the seasonal colours provide a beautiful backdrop to the Cotswold stone hotel. Walk down stone pathways bordered by miniature sculpted hedges next to manicured lawns and feast your eyes on the flowers. Enjoy the Laburnum Avenue walk beneath a leafy canape of branches, the pathway bordered by purple plants. Cast your eye over the sheer detail which went into the mini knot garden and neat vegetable patches. Barnsley is a piece of garden artwork with features similar to those of stately homes – a beautiful addition to the quaint Cotswold house, and not to be missed while on a spa day. Barnsley Spa is hidden away in the gardens of Barnsley House, surrounded by trees and ornate shrubs. Secluded from the main hotel, the atmosphere is tranquil and intimate with only six guests allowed in at one time. The spa’s design brings the nature of the surrounding garden inside; wicker walls line the post-treatment relaxation room, and a large screen showcases grasses blowing in the wind. The main relaxation lounge is large and filled with light, with neutral furnishings and views of the pool and a walled garden. You can see how special Hoar Cross Hall’s gardens are from the moment you drive up to the hall’s turreted stone archway. 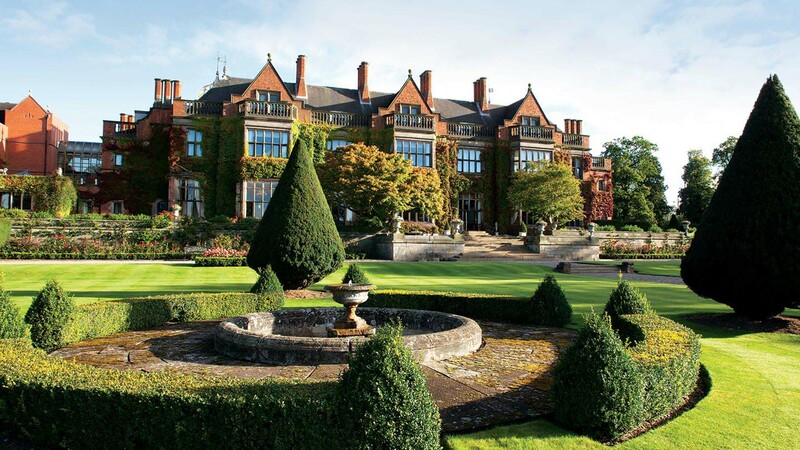 Impeccable grounds surround the building, with neatly cut lawns framed by yew hedges, and gravel pathways leading past herbaceous borders and fountains to a rose garden. 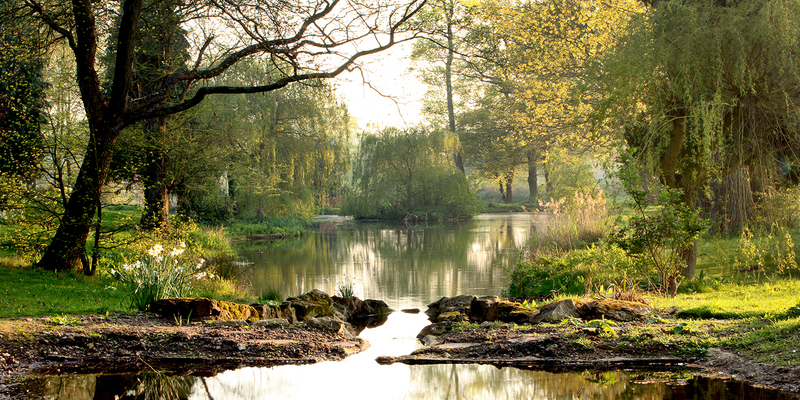 Wander between oak and lime trees in the 30 acres of mature woodland and enjoy the tranquil Italian water garden, where a fountain draws water from underground rainwater storage. The herb gardens at Hoar Cross are also worth a peek, as are the original Victorian greenhouses, both of which grow produce for the kitchens. 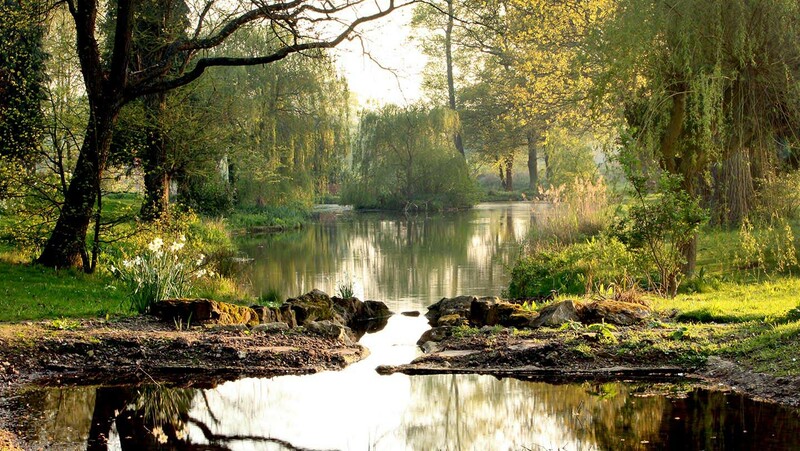 You may discover the six lakes as you walk around the grounds, where wildlife is encouraged and protected. The Hoar Cross Spa is in the basement of the hotel, with a 26-metre saltwater vitality pool, hydrotherapy pool, aqua massage, a cold plunge pool and an aqua detox area. After you’ve had a day of relaxation in the spa, step into the gardens for a stroll in the fresh air. Lifehouse Spa is surrounded by the English Heritage Listed Thorpe Hall Gardens, which have had many celebrated visitors over the years: JM Barry used to write in a summer house by a slope now named Peter Pan Walk, and another summerhouse is named after Rudyard Kipling because it was his favourite spot. Queen Mary is said to have loved the gardens, and there’s now a walkway and summerhouse named in her honour. Winston Churchill inspired the name for the Churchill Summer House as he regularly visited the owner of the grounds, Lord Byng, after they served together in the Boer War. Today, you can explore the gardens in your robe while staying at Lifehouse.The outdoors seating of the restaurant forms part of what was once the kitchen garden. Although not grown for use on the Lifehouse menu, the decorative plants here are edible, including herbs, olives and grapes. Wandering further through the grounds will take you past lakes and ponds to a rock garden, and a sunken terraced garden full of wild plants. You’ll see some exotic plants still surviving among the native flora, ancient pine trees guarding the garden boundaries, and gunneras dotted near the water. The Lifehouse gardens are a delightful mix of wild and maintained gardens, and there are plenty of tranquil summerhouses and lawns to dream away an afternoon once you've had a treatment in the spa. 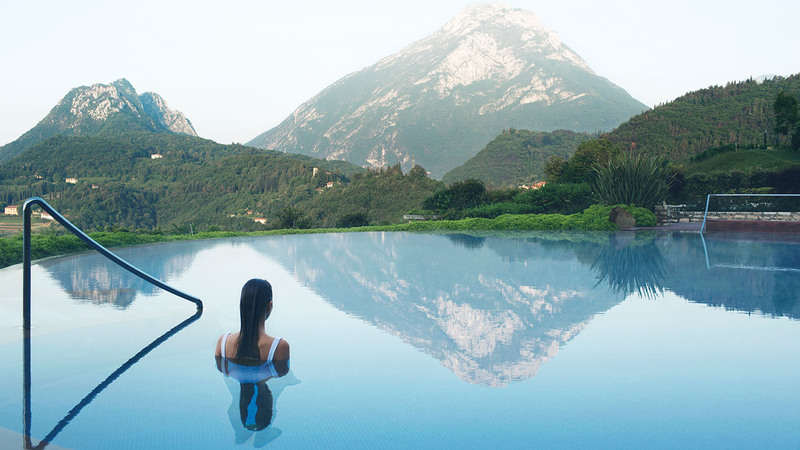 Choose from the standard facials and massages, or stay for a health and wellness retreat. Swim lengths in the 20-metre pool, soak in the hydrotherapy pool, and explore the sauna, steam and salt inhalation room. The Walled Garden at Lucknam Park is very English, with shaped yew hedges and box hedging alongside borders planted with herbaceous flowers. At its centre is an 18th Century dovecote which marks the oldest part of the Lucknam gardens. Moving on to the Rose Garden, you’ll see a French-style courtyard backing onto the original stable building. Fruit trees line the walls and there’s a small pond glinting in the middle. The Victorian-inspired Kitchen Garden has more yew and box hedging framing a selection of culinary herbs. On the west lawn, Lucknam has a formal and circular lavender garden, gloriously scented in the morning and evening air. You can also wander through an arboretum of 600 trees, visually lovely all year round. Finally, take a peek at the renovated vinery greenhouse with raised beds growing over 30 varieties of produce; if you try the food at Lucknam on your spa visit, these will be on the menu. 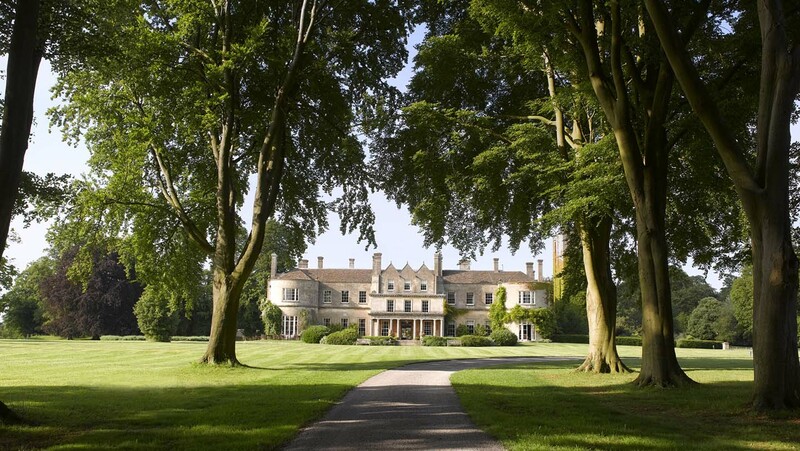 Lucknam Park Spa is set in a glass and stone extension at the back of the country mansion house hotel. Guests walk past rustic lavender beds to get from hotel to spa. You even have garden views from the tepidarium beds or the outdoor terrace around the pool. There is plenty of spa to entertain for a whole day, including a stunning swimming pool with a flickering panel of fire along one wall; but be sure to also set aside time to go and explore the delightful gardens, which span over five acres of Lucknam’s extensive grounds. 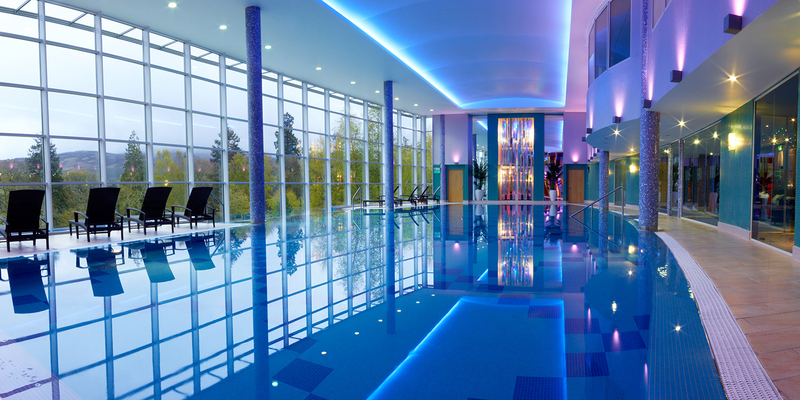 Stobo Castle Health Spa sits in the Peeblesshire countryside, near a loch on the River Tweed. Catch glimpses of the lowlands countryside from the spa facilities, or admire the view from the outside hot tubs. 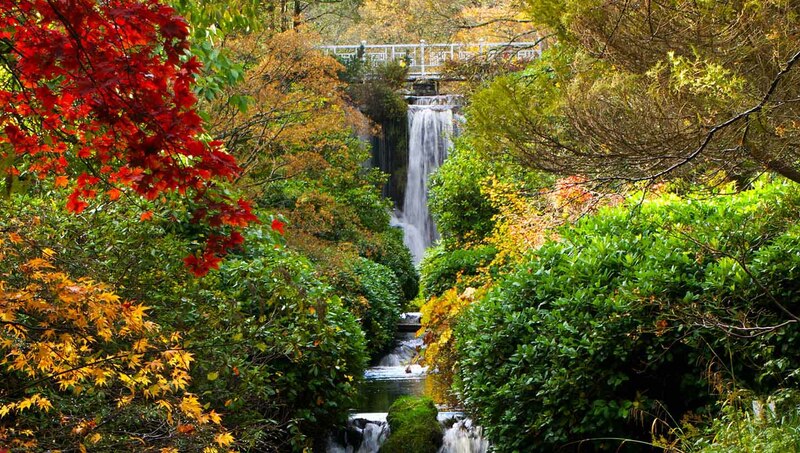 But be sure to venture to the Japanese garden, Stobo’s stunning oriental water woodland. The landscape falls dramatically away to waterfalls and pools, with a signature Japanese-style bridge at its centre. Admire the garden with its echoes of traditional Japanese architecture. Stepping stones, the humpback bridge, and trees and shrubs with Eastern origins are interwoven with ageing stone lanterns and a tea house which was part of the original historic garden. The pleasure loch was created when a dam was built to provide hydropower for the estate, its water from a natural burn in the hills above the castle. During autumn the garden is at its most colourful with the mix of leaves from the magnificent trees and shrubs. However, in spring there are primroses and wood anemones, followed by summer’s vibrant foliage of rhododendrons and azaleas. 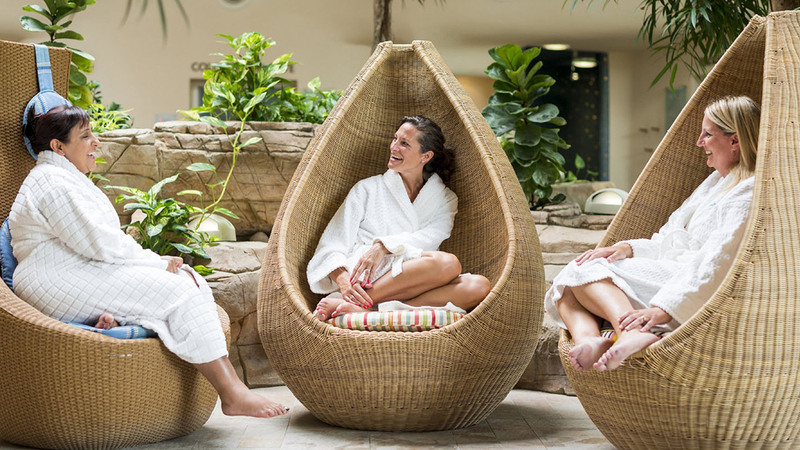 With 80 treatments to choose from including chromotherapy hydrobaths and bespoke wraps, Stobo is the perfect place to get your spa (and garden) fix. The spa offers separate male and female thermal facilities, plus a shared 25 metre ozone infinity edge pool with floor to ceiling windows. There’s also a hydro pool and mild steam room in the central area, and outside hot tubs to gaze out over the surrounding gardens. 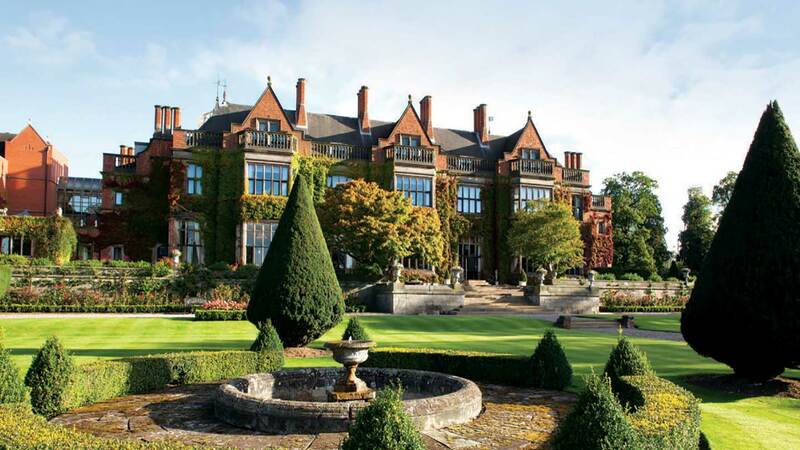 Congham Hall sits amid green fields and winding lanes in stunning Norfolk countryside. The petit hotel is beautifully rural with 30 acres of parkland surrounding the hall. The spa is in the herb garden – a charming rustic kitchen garden with almost 400 varieties of herbs. The repertoire includes rare and medicinal varieties such as goat’s rue, said to have once been used to treat the plague. But the main function of this lovely garden is culinary. Gardeners pick herbs daily for Congham Hall’s chef to include in seasonal dishes and in homemade aromatic oils and vinegars. Visitors come from miles away to wander through the herb garden down gravel pathways, admiring the herbal scents which are most delicious in the evening air at dusk. Spa guests can also enjoy the garden setting, with glass doors opening onto patios and views across the lawns and fields. The Secret Garden Spa is just next to the Georgian hotel, in a modern extension next to neatly manicured gardens. The reception area is decorated in soft lavender tones reflecting the surrounding flora. The spa’s shining feature is the outdoor hot tub – wonderfully warm and the perfect spot to gaze out over the neighbouring fields. 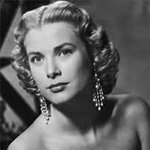 What does a destination spa offer?